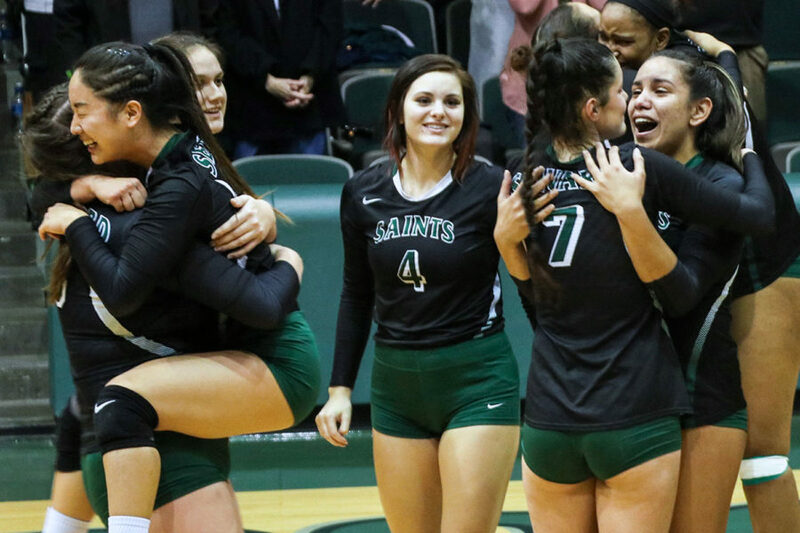 The Lady Saints volleyball team earned the best finish in program history after finishing in fourth place during the NJCAA National Tournament in Hutchinson. After losing in the semi-finals to the College of Southern Idaho, Seward County Community College went up against the Iowa Western Community College Reivers for third place. To begin the third place game, SCCC started off strong with a 8-3 lead. The Reivers were able to cut the lead to two, but not for long before Seward extended their lead and won the first set, 25-15. The Lady Saints started the second set with another lead, but the game quickly became tied at 13. Iowa Western came out on top in the second set after a 12-4 run to win the set, 25-17. With both teams each having a win, the two battled to see who the winner would be. The final set was back and forth the whole time between both teams. The teams combined for a total of seven ties and four lead changes. Seward started with a 7-4 run, but Iowa Western refused to give up and tied the game at 10. The Lady Saints were able to score another run to give them a three-point lead, 19-16. IWCC stole back the lead, but then SCCC tied the game and then earned a one-point lead, 23-22. After a timeout, Iowa Western went on a 3-0 to win the set and the game, 25-23, 3-1. The Lady Saints were lead by freshman outside hitter, Djuly Schmorantz who finished with 20 match kills. Sophomore right side, Giovanna Tapigliani and sophomore hitter/setter, Esmadar Tavares each finished with 11. Freshman setter, Laura De Pra contributed 51 assists. After a successful 32-7 season, three Lady Saints sophomores leave their names in the record book. Middle hitter, Luz Sierra finishes her career with the fourth highest hitting percentage (.405). Tapigliani finishes with 910 career kills, the sixth most in school history and libero, Nathiellen Machado became just the sixth player to record 1,000 career digs, finishing with 1,054, the fourth most in school history.